Eddie created AR Auto Service in 2006 as a way to share his enthusiasm and knowledge with the community. Eddie is an accomplished motorsport driver with championships and records around the country and abroad. These accomplishments include being a veteran driver at the 25 Hours of Thunderhill and the Idlers 12 Hour Enduro in Motegi, Japan. Eddie has dedicated his life to build a business for the enthusiast, by the enthusiast. Dan, a Portland Native, has been around the service and performance industry for the past 13 years. His professional resume consists of being a certified BMW technician, working on the world's fastest 911's, and now at AR Auto Service overseeing racing operations. As an enthusiast, Dan has countless hours behind of the wheel of his own race car. Gabe has been in the automotive customer service and performance industry for over 7 years now. Gabe started out as a service advisor at a small European repair shop, a sales specialist helping create the world's fastest Porsche 911's, and then working as an advisor at Porsche dealership before coming to work for AR Auto Service. Gabe is a track enthusiast who works and travels with several racing series as a race control official. Martin is a wealth of knowledge that has come with the experience of building his own street cars all the way to wheel to wheel racing. All while pursing a law degree on the side. He has continued to stay on the forefront of performance technology with his connection amongst the aftermarket performance companies around the world. Jake has been the backbone of AR for over 6 years as our in house fabricator and shop logistics coordinator. Outside of AR, Jake is an avid off-roader who enjoys the outdoors rain or shine. You will often see him on the trails with his Jeep or his quads. Starting with his father’s Porsche 951, Ian has been wrenching on cars for nearly his whole life. Ian is an honest and friendly guy and without a doubt one of the best technicians around. Ian is also a highly skilled driver that has quite a bit of on-track experience in a Lotus Elise. When the sun is out, you will more than likely find Ian on his motorcycle. 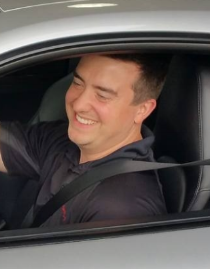 Josh is a family man that started his life with a career in the medical industry, when he decided to change gears and pursue a career in the automotive field. He has been working around cars for over 10 years and enjoys going to the track to be around fellow enthusiasts and competing in wheel to wheel racing. Mochi is a Shih-tzu who is no doubt the boss of AR Auto Service. He enjoys seeing the UPS delivery truck, because he routinely brings him treats. When you walk in, Mochi will greet you at your feet and will encourage you to pet him.